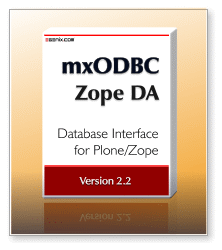 Connect your Zope/Plone installation to all ODBC compliant databases and data sources in a hassle-free, robust and scalable way - with our new mxODBC Zope Database Adapter™ for Zope and Plone. # This part will download and install the mxODBC Zope DA egg. # you likely have a UCS2 build. # using the system provided Python, you will need the UCS4 URL. # These two parts are used in the Unified Plone Installer and Zope. # be removed when used with the Plone Windows buildout.cfg. # in a separate base.cfg file. # Zope startup, so that Zope can find the license files. In the above example, you have to replace ***license-serial*** with the directory name of the directory which contains the mxODBC Zope DA license files. If you have a Zope/Plone installation that uses a UCS4 build of Python, please also adjust the index links accordingly. Special attention has to be paid to the [instance] and [zopepy] sections of the file. These may only be used if the main buildout.cfg defines these sections in a separate base.cfg file which extends buildout.cfg, otherwise the append logic used in the above recipes doesn't work as expected. Next, add a reference to this file to your buildout.cfg file and run buildout to have the mxODBC Zope/Plone DA installed in your instance. After restart of Plone/Zope, you will then find a new entry for the eGenix mxODBC Zope DA Connection object in the Zope Management Interface (ZMI) add object drop-downs. In the above you will have to replace the two license serial directories with the correct ones for your license: ***license-serial-1*** and ***license-serial-2***. If you have a Zope/Plone installation that uses a UCS4 build of Python, please also adjust the index links accordingly. Next, add a reference to this file to your buildout.cfg file and run buildout to have the mxODBC Zope/Plone DA installed in your ZEO cluster. After restart of the Plone/Zope cluster, you will then find a new entry for the eGenix mxODBC Zope DA Connection object in the Zope Management Interface (ZMI) add object drop-downs.